SCRAP-LOVE: My first Art Journal page! My first Art Journal page! Now that all my projects from SAL are ready it is time to start something new! 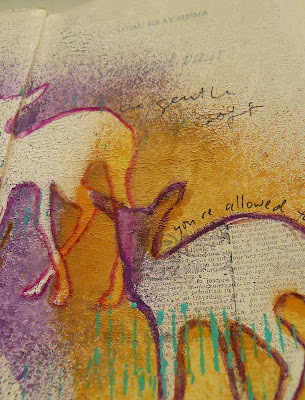 I decided I wanted to follow the online Art Journaling classes from Dina Wakley. I loved the spray painting technique she taught us at SAL and heard people talk very positive and with enthusiasm about her Art Journaling 102 classes. First I had to decide about what I'm going to use as an Art Journal. The paper has to be thick enough for (spray)paint without buckling up too much. Because I like to work on a small surface I decided I wanted to use an old book. The paper in old books is thicker than the paper in modern books and you can buy great old books for just 50 eurocents at thrift shops. But because I thaugt the paper was still too thin I glued 2 pages together using an acrylic bookbinder. You have to make sure that there aren't any bubbles with air in between the pages and that you let it dry completely before using gesso or (spray)paint on the pages!! I have just finished my first art journal page and it turned out just great! Now that I know that it is possible to use an old book as an Art Journal I have to decide how I want my journals to look like from the outside and if I'm just tearing out a part of the pages or that I use the technique Martha Bonneau taught us at SAL and then use the bind-it-all. I think it will be the latter because it allows me to work on single pages which will be much easier if I'm also going to sew on the pages. 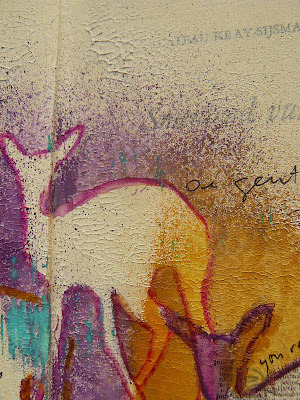 My first art journal page is about applying gentleness into my life. I tend to be hard on myself (and others) when I (they) make mistakes. For the last couple of weeks when I went out for walks near my house it often happened that I saw some deers. Even in the middle of the day, which is a very unusual time for deers to show themselves. Native Americans believe that animals that cross your road try to tell you a message. Actually it's a message from the Great Spirit (God). One day I saw 3 deers at the same time. I was particularly very judgmental about myself that day and knew right away that I had to apply gentleness and loosen up a bit. The motif I used for my page is a deer that I scanned from a children's coloring book. I used three different colors of spray paint (eggplant, wild plum and butterscotch). 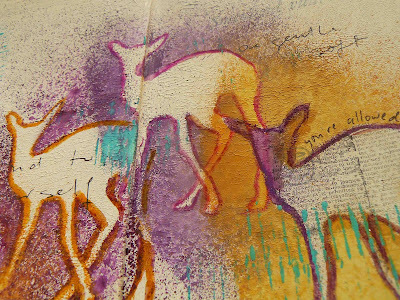 I outlined the deers with four different colors of watersoluble wax pastels (pink, orange, purple, old rose). 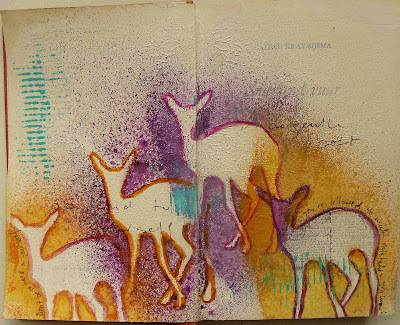 In one deer I used a stamp (a text bloc about journal/journey from the Tim Holtz collection). To finish I used some aquamarine acrylic paint and a piece of corrugated cardboard as a mono stamp. Also added some words with my Pilot DVD writer. I'm sure I can work on this page even some more but I like it for now. This is wonderful work. Love it. These are lovely, such great colors, such great images.